Moving abroad or buying a holiday home can be exciting and stressful at the same time. The last thing you want to be doing is trawling around the shops and moving furniture into your new home. Some homeowners have their own furniture moved over to Spain, but this is not cost or time effective and especially if you don’t have contacts in the transport business. Buying furniture packages from a long established company like Furniture Spain can make your transition from the UK, or for that matter anywhere in Europe, to Spain much easier. All you need to do is choose your furniture package from Furniture Spain and the rest will be done for you. This truly is the hassle free way to decorate your holiday or permanent home in Spain. All you need to do is look on our website, www.furniture-spain.co.uk to decide which furniture package you would like and would suit your property. You may visit our showrooms, by appointment, in order view all our furniture packages from settees, to beds, to towels, lamps and soft furnishing and we normally ask clients to allow 2-3 hours to go through all of our furniture ranges and associated fabrics and colour options. Although a large proportion of our past clients never visit us but select their furniture etc from photographs we email over to them and only see the finished property on the very first day they visit it. Once all of the furniture and fittings are fitted we do email photographs of your property over to you. A complete furnishing package, from Furniture Spain includes not only large furniture items, but will also include relaxing essentials like television, DVD player, toaster, kettle, cutlery, dishes, glasses, cookware, curtains, towels, bed linen, paintings and up to 7 ceiling lights supplied and fitted. 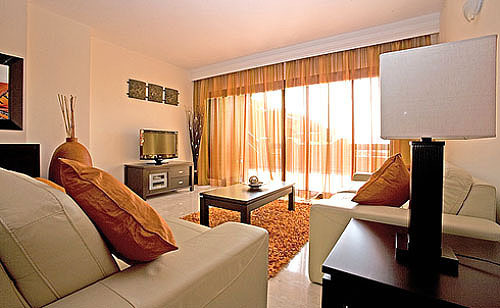 Infact, everything you will need in order to start using your apartment, townhouse or villa from day one. You don’t have to be there when Furniture Spain installs and fits the furniture package, as we arrange everything. We arrange to get the keys from the developer or Estate Agent and sort everything out. You do not have to be present and you do not have to do a thing - Just enjoy your new home from day one. You can have a package within 4 weeks from placing your order if all the items are in stock. However, to avoid any disappointment we strongly recommend that you place your order 10-12 weeks before your completion date. To make it even easier for you, can you pay for your furniture package in Spain in either GBP or Euros and all delivery and installation is free of charge. If you would like more information about our furniture packages Spain or would like a brochure, you can find all the required details on the contact us page. So why not choose a furniture package from Furniture Spain and let us do all the work, so when you arrive in Spain all you have to do is enjoy your new Spanish property, the sunshine and the sea.